I just stumbled onto some stats pages under Team Enhanced stats on NHL.com that I thought I'd share. Rangers are 25th in OZ FOW%, 6th in DZ FOW%, 26th in NZ FOW% (basically, Dominic Moore). They also have wins and losses when ahead, behind and tied, although for some reason they don't give you percentages on those, just totals. As with many of these displays, you can check out matchups, so in scouting tonight's game, you could see that the Rangers have won 48.4% draws against the Devils in their previous three meetings. Rangers are 26th in the league in Back hand goals with 12, 10th in Slap Shot Goals with 20. They have a number of shot types, goals based on shot types, along with missed types (Cross bar, Post, Over and Wide). Again, you can limit by team and opponent if you want. Inexplicably, you can't filter or sort this Report by team, so you have to dig. You can change from season view to a date range though. Not great, but if you're trying to track down a game from Mid January, you can narrow the results. Note: In all but the Game Report, you can remove the "Aggregate Results" check box and instead get a game by game report. So if you want to see how the Rangers faceoffs were in each game against the Devils, that can be done here. This calculates player salary after taxes by market. Best season of his career 5v5. The scary thing too is that he's doing so well despite facing a lot of quality chances from up and personal. Eddie Lack, 1326.47 of 5v5 TOI, is facing shots of closer average length than Lundqvist with an AVG distance of 29.18 feet. wouldn't expect such a tremendous surge despite such an onslaught. Keep in mind 7 of the last 10 Cup winners were top-5 in possession statistics. I'm assuming the line represents the season thus far? That means we've only gotten worse as the season has gone along. I said it in the GDT but the amount of shots we give up is frightening. Seems like we're outshot by almost double every night now. Yes. Some of that comes with having a lead though. Teams demonstrate a hit to their possession stats when they have a lead. And the Rangers have led for the 2nd most amount of time in the league. Honestly, if they could stop blowing leads and fix their PK, a lot of this team's problem can be solved. Obviously it comes down to personnel and overall gameplan though. Oh definitely, good teams tend to have good possession stats. 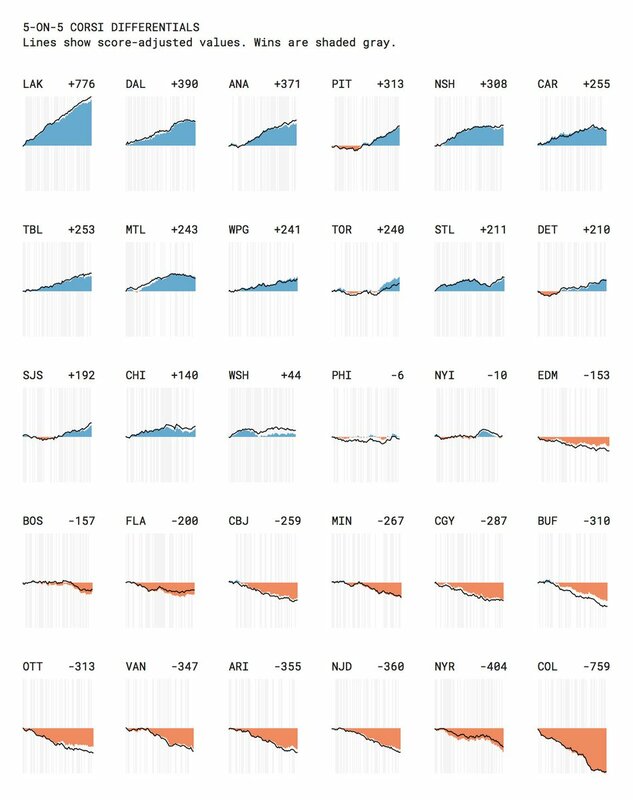 But even the best teams see drops in corsi% when they have a lead vs. when they're tied or trailing. Obviously, that effect is bigger for certain teams over others.